A new open source project dubbed Guacamole allows users to access a desktop remotely through a Web browser, potentially streamlining the requirements for client support and administration. According to its developers, Guacamole is almost as responsive as native VNC and should work in any browser supporting the HTML5 canvas tag. The Guacamole server requires a Java servlet container like Apache Tomcat, while the client side requires just a Web browser supporting HTML5 and Ajax. 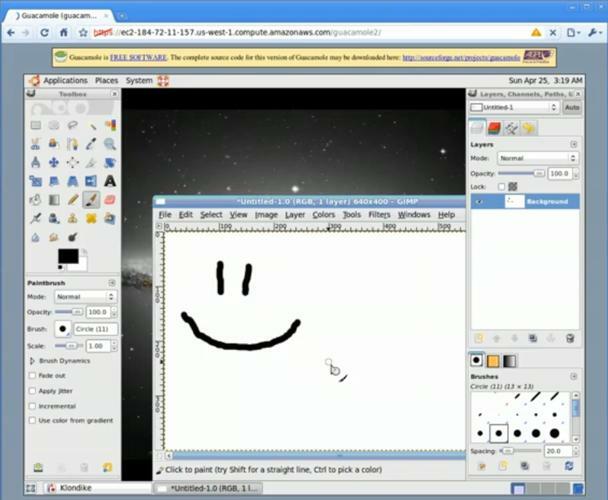 Features include CopyRect encoding and client-side cursor, if both are supported by the VNC server. With Guacamole, any Linux desktop should be accessible over the Web, without the need for dedicated client software. The HTML 5 canvas element allows for dynamic, scriptable rendering of two dimensional shapes and bitmap images. According to the W3C, the canvas element provides scripts with a resolution-dependent bitmap canvas, which can be used for rendering graphics or other visual images on the fly. Guacamole release 0.2.0 (testing) was released this week and adds clipboard and mouse scroll wheel support and a redesigned user interface. The only other requirement is a VNC server for X, the graphical display for Unix. X11vnc is recommended. The Guacamole project online at: http://sourceforge.net/projects/guacamole. The software is licensed under the AGPL.